This exotic palm is sure to turn your garden in to a tropical paradise for years to come! Tough and architectural, these palms will make a striking addition to any garden. Growing as tall as you let them, these stunning palms are perfect as a centrepiece. Theyll also look great in a large pot on your patio! Supplied as an 80-100cm tall plant in 20cm pot. This exotic palm is sure to turn your garden in to a tropical paradise for years to come! 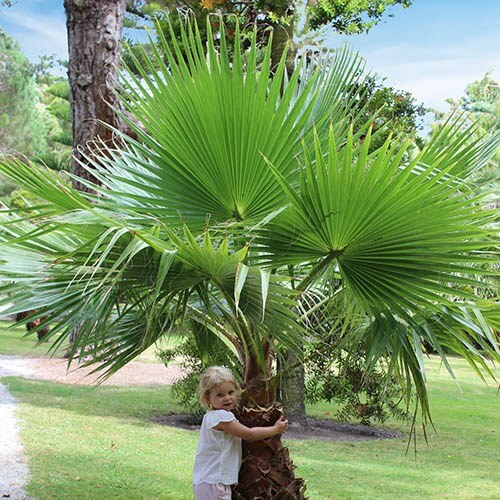 Tough and architectural, these palms will make a striking addition to any garden, with their spiky foliage creating vivid, dancing shadows in the summer sun. They have large, deeply ridged, fan-shaped leaves that will spread luxuriously out above the stout trunk, forming an impressive canopy of bright green foliage. Commonly called Cotton Palms because of their wisps of 'cotton' like strands that fall from each leaf, they provide a wonderful spectacle in any setting. Growing as tall as you let them, these stunning palms are perfect as a centrepiece, or to add height to borders. They'll also look great in a large pot on your patio! Supplied as a 80-100cm tall plant in 20cm pot. Water well in Spring and Summer - despite their tropical looks!